A shop favorite, this high-sided plate set is perfect for chips & dip, appetizers & sauce, nibbles and condiments...you get the idea - a versatile way to show your love of the Great Lakes State. 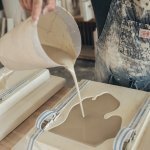 Made in Michigan by Corbe' Ceramics. "We’re all locals somewhere, with a home in a hometown in a great state. We've shared work and it’s rewards with friends, toiled in kitchens for family holidays, and built our lives knowing the places we’ve been and the people we’ve known there will resonate through all we do. 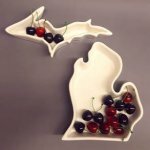 The Michigan State Plate is for those people, a celebration of home and all it's sentiments, from our hands to yours". 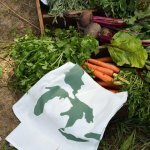 Gift, serve and style with Michigan State Pride. 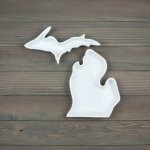 Each porcelain State Plate is handcrafted with character and distinction in Detroit, MI for the Michigander in all of us.